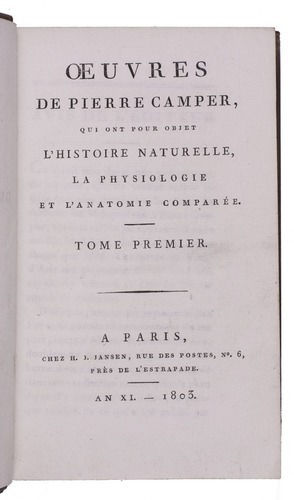 Oeuvres de Pierre Camper, qui ont pour objet l'histoire naturelle, la physiologie et l'anatomie comparée. 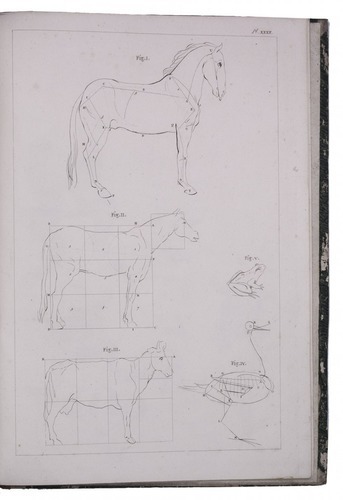 Paris, Jansen and Bertrand; Bordeaux, Melon, 1803. 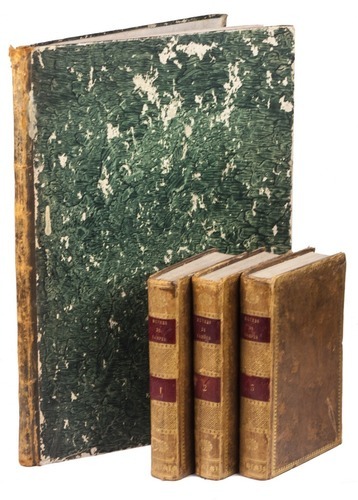 3 text volumes (8vo) and 1 plate volume (folio). 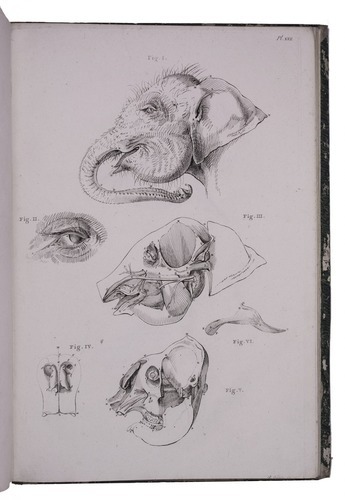 With stipple-engraved author's portrait by B. Roger and 34 numbered engraved plates with anatomical illustrations of animals by Picquenot and Vinkeles after Camper, including an orangutan and an elephant. Text volumes bound in contemporary mottled calf with richly gold-tooled spines, and the plates volume in contemporary half calf with green marbled sides. 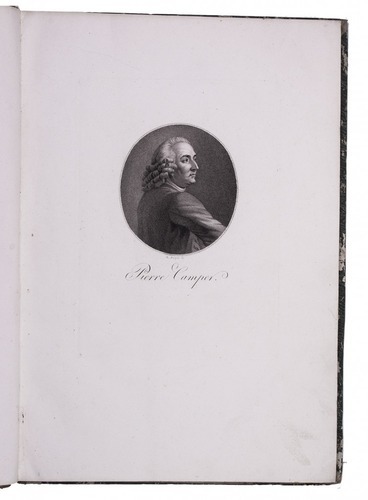 First edition of the collected works of the versatile Dutch physician, naturalist and notable comparative anatomist Pieter Camper (1722-1789), mainly dealing with comparative anatomy. The text was translated and edited by Hendrik Jansen (1741-1812). 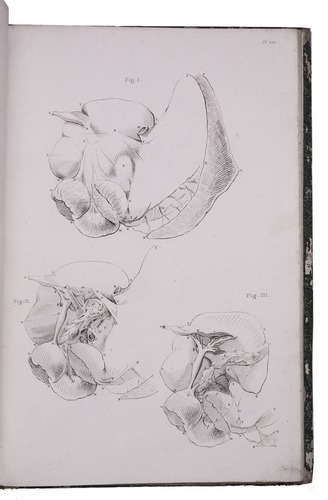 The plates volume was also separately published by Theodore Dabot at Paris in the same year. 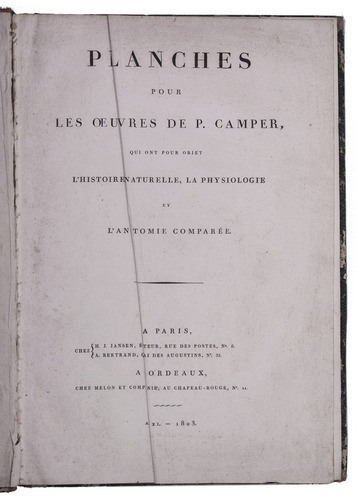 The collection of treatises starts with a biography of Camper, written by his son, followed by eulogies by Vicq d'Azir and Condorcet. 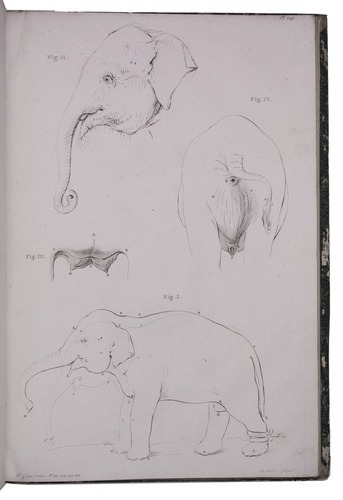 The first volume includes articles on the orang-utan, the rhinoceros and a description of the fossil findings at the Sint-Pietersberg (Mount Saint Peter) near Maastricht. 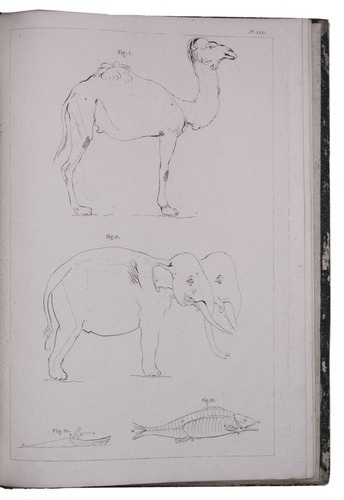 The second volumes contains an extensive description of the elephant, a treatise on human and animal diseases and a treatise on the origin of the skin colour of black Africans. In the third volume Camper expands on the physical education of children. The title-page of the plates volume is slightly soiled, and the binding rubbed. Otherwise in very good condition. Choulant, pp. 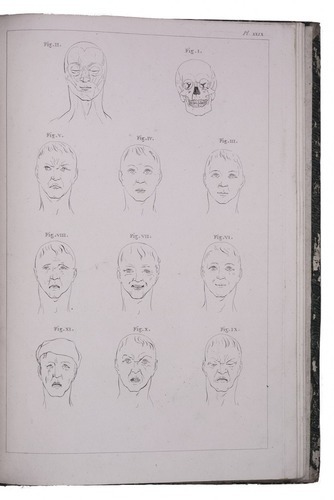 284-287; Nissen, ZBI 796; Wellcome II, p. 293 (plates volume only); cf. C.E. 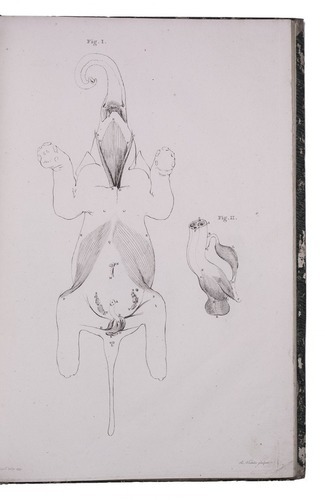 Daniels, Het leven en de verdienste van Petrus Camper (1880); Hirsch, Lexikon der hervorragenden Ärtze I, pp. 651-653.